The action of covering up does not simply hide but it may also reveal. The contrast between the making of evident and veiling is rooted in an approach to what we know and the ways in which we know. Like in Plato’s Cave, actions of veiling have been symbols of obstruction and distancing humans from the Real. The artist Jeannette Slütter speaks about this dispute, creating environments of oxymoronic displacement. In her work, surfaces and practices of veiling may not simply be an obstacle but it often becomes a method of questioning. In this sense, the surface becomes not only a space of superficiality and corruption but also a space for disputing the superficial and its meanings. Not simply a manner to dispute what the Real is but – most importantly – what makes the Real and when we encounter the Real. How did you start working in the art field? I started studying at the Royal Academy of Arts in The Hague in the photography department, but I figured out soon that this was not my medium to work with. It was an interesting study in the sense that photography is a direct reflection of reality. But I had a hard time communicating through my photographs. For me, the difficult part was that photography has a clear demarcated frame, and whatever you do is limited to that frame. It felt flat and I came to the conclusion that I needed movement and space to communicate my thoughts. I felt that there were more possibilities outside of photography, and therefore I switched departments – from Photography to Fine Arts – which came as a relief. I still use photography as a medium for reproduction, because that is the most appropriate way for me. Your first project ‘Grijze Vloer’ shows your interest in meta-practices and meta-thinking that seem to resemble an obsession with the mechanics of a space and the ways in which individuals become ingredients of it. That’s definitely a point of interest in my work. I like to research how we make connections between elements, what people do expect before something occurs, and how much we are influenced by the context. This includes the space and surrounding, and ‘Grijze Vloer’ – which means ‘grey floor’ – was a space-filling installation that dealt with these aspects. The idea of surface may be connected to your work. What kind of surfaces are you interested in and how do you use them? In my work I can name two kind of surfaces. One more literal, where it’s about the physical surface of objects. For instance, with ‘Grijze Vloer’ I reproduced a simple stool made of wood and steel into a ceramic one. This puts you on the wrong track, since it’s so fragile and useless. This leads me to the second interpretation of surfaces, because it’s these layers that unfold when you wander through my work. It can mislead or surprise you, or grab your attention towards something that was hidden before. What is the project ‘Opdoeken’ about? What was your aim with this work? This project was part of the Salone del Mobile in Milan, Italy. This is the biggest fair for furniture in the world. Contrary to the complete fair, this exhibition would show only works of art and no design objects. 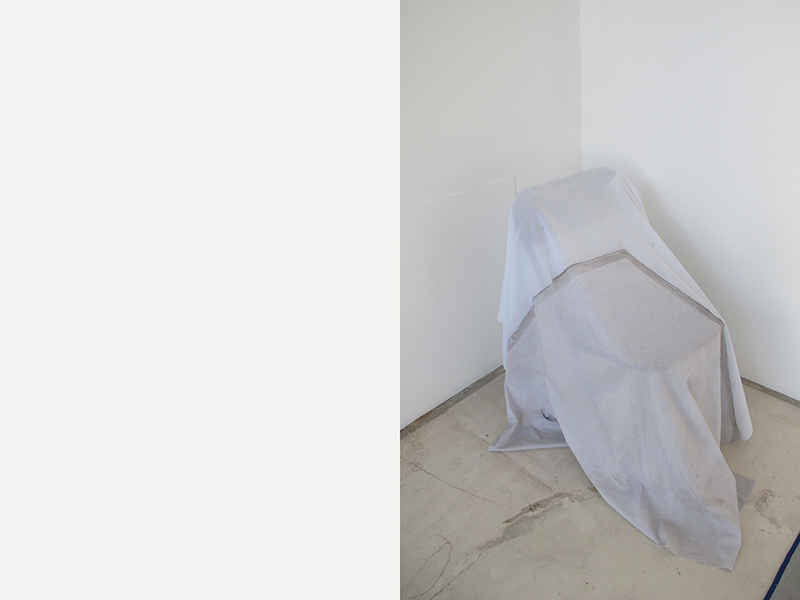 However, in the process of the exhibition, there was the idea of chairs where employees could sit down – something which seemed to me illogical to the concept. The entire fair presents thousands of chairs and this exhibition had the intention to deviate from it. 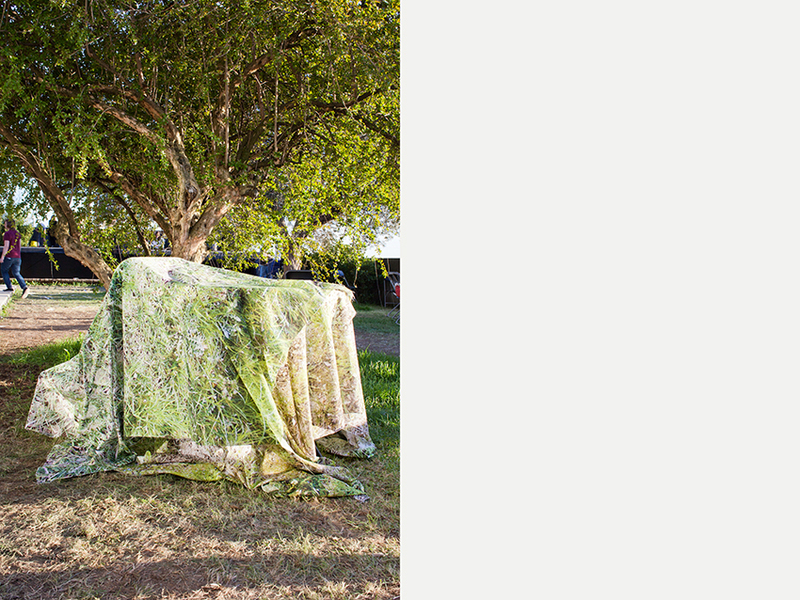 That’s why I thought of the work ‘Opdoeken’ : a performance that printed drapes of the substrate (grass or stone) were dragged over the chairs so that they could not be visible due to the camouflage effect. But just because you cannot really make them invisible, they become an object again. As soon as the chair had to be used for functional moments, it could be “opgedoekt” (revealed). For this reason, there was a continuous performance of laying cloths on the chairs and retrieving them. The title of this work is a Dutch play of words, since the Dutch word “opdoeken” has a double meaning. The aim of the work is to play with the perceptions of the visitors, and I try to give a different perspective. It seems that your work speaks loud to ideas of reality and non-reality through allusions which become both physical and visual. Can you explain how you approach these issues in your work? As all of my works are site-specific, they relate in visual terms to the location – but also the concept of every work is related to the context and surrounding. Sometimes I anticipate the memory of the visitor, by copying objects they could have seen before entering the space. These actions of displacement work especially if a space is supposed to have a function such as ‘entering an exhibition space’ which has the supposed function to present art. But what function do the spaces that surround this presentation space – such as the corridor or the outside world – have? Are these spaces subservient? My interest lays in questioning when something is appointed to play a certain role – and I wonder what happens when it steps outside of that role. I suppose I try to somehow enter the perception of someone. When did you come to the conclusion that things are real or definable? Should we not question those things over and over again? Many of your works ‘Opdoeken’ and ‘It doesn’t stop starting’ seem to play on the idea of ‘covering up’ since you seem to be attracted by practices of concealment and revelation. What do you want to cover and what do you want to reveal via covering? With ‘Opdoeken’ I play with the idea of pretending to ignore the existence of something, although we all know that it’s there. I play a lot with copying, but that does not necessarily mean that I want to hide or reveal something. More so, it refers to a different time, so an object – to some extent – can function as a time capsule of that specific place. When I think of my work in general, I think that it tries to reveal how decisions are made, how you can be influenced by your surroundings, and that not everything has a clear and definite conclusion. Working and living between The Hague and Rotterdam, Jeannette Slütter’s work consists of site-specific installations and situations. She creates a constellation of minimal interventions, working with variable materials such as ceramics, prints and daily used objects. 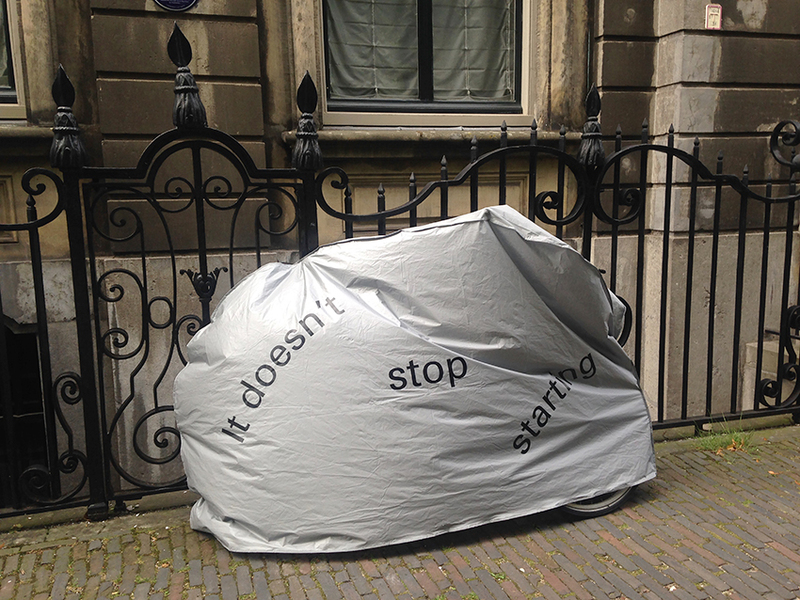 Her last show was a solo-exhibition ‘It doesn’t stop starting’ (2017) at the exhibition space ‘Moira’ in Utrecht and in 2019 she will have a residency at ‘Sundaymorning@EKWC’ in Oisterwijk (Holland). Marco Pecorari is the Director of the MA in Fashion Studies at Parsons Paris where he teaches fashion history and theory. He holds a PhD from the Centre for Fashion Studies at Stockholm University. This interview was published in our latest print issue where our contributors took a look at fashion as a cover-up.